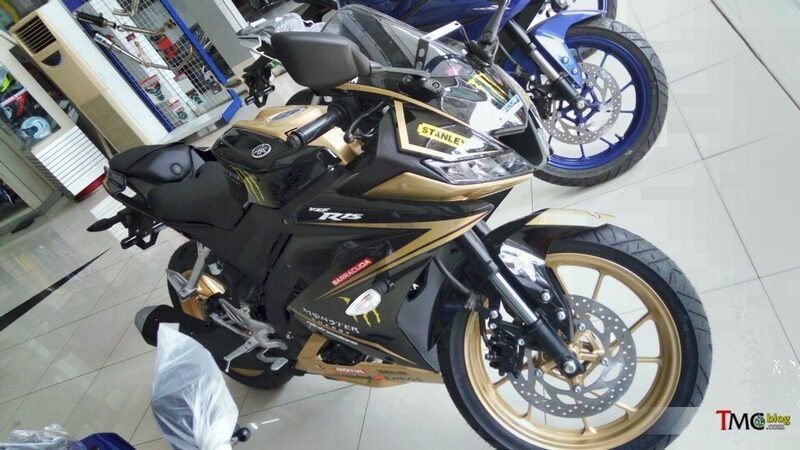 Yamaha R15 the smallest Baby ‘R’ from the Yamaha stable has been spotted in exclusive Monster Energy Edition with Gold and Black livery. But this is not a special edition paint scheme from the company, instead, its been done at dealer level in Indonesia. One can spot the USD forks to distinguish it from Indian model. Golden lines flowing from the front of the bike all the way to the back enhances the look. Gold painted Alloys match the overall scheme. Various Monster Energy, Stanley, Michelin and custom stickers can also be seen. This livery carries a price tag of approx INR 13,000 which justifies the amazing paint quality and styling done on it. The R15 runs on a 150cc, liquid-cooled, single-cylinder, SOHC, fuel injected, 4 valved, motor which has a VVA technology (Variable Valve Actuation). The bike is capable of producing a power output of 19.3 PS at 10000 rpm and a peak torque of 14.7 Nm at 8500 rpm. A slipper clutch is also provided with the bike. The engine comes mated to a six speed manual gearbox. The bore and stroke of the bike is 58 mm and 59 mm respectively. The bike comes to standstill with the help of 282 mm and 220 mm disc brakes in the front and rear respectively. 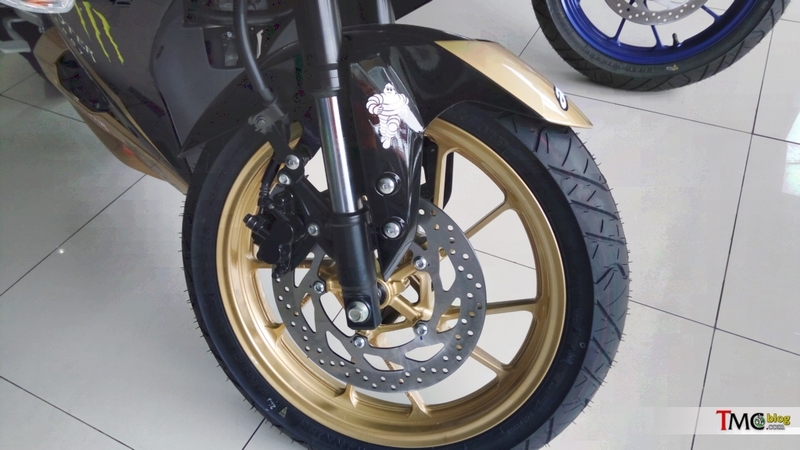 Although, the Indonesian version of R15 V3 comes with Anti-lock Braking System (ABS). Additionally, the Yamaha R15 V3 also has Upside Down (USD) front suspension. The tyres in front and rear are of 100/80-17 M/C 52P and 140/70-17M/C 66H tubeless ones. The Deltabox chassis bike has the dimensions, 1990 mm length, 725 mm width and 1135 mm in height. The ground clearance is 170 mm and the wheelbase is 1325 mm. The curb weight is 139 kgs. The fuel tank has a capacity of 11 liters. Here is our detailed review for the R15 V3.